The Duncanville Fire Department is offering a Civil Service exam on Saturday, March 24, 2018. Individuals interested in a rewarding opportunity protecting lives and property with pride and tradition are urged to fill out an interest card to be eligible for the civil service exam. The Duncanville Fire Department has great opportunities within its divisions: fire administration; fire prevention; fire suppression; advanced life support; and emergency management. For an opportunity to work with the department, submit an interest card by end of business on Monday, March 19, 2018, to be eligible for the exam on March 24. To fill out an interest card or learn more about the Duncanville Fire Department, click here. The Duncanville Fire Department is offering a Civil Service exam on Saturday, October 7, 2017. Individuals interested in a rewarding opportunity protecting lives and property with pride and tradition are urged to fill out an interest card to be eligible for the civil service exam. For an opportunity to work with the department, submit an interest card by end of business on September 29, to be eligible for the exam on October 7. The Texas Comptroller’s Office has issued a publication informing taxpayers that the emergency preparation supplies sales tax holiday for 2017 will begin at 12:01 a.m. on Saturday, April 22, and end at midnight on Monday, April 24. During this period, certain emergency preparation supplies can be purchased tax free with no limit on the number of qualifying items that can be purchased, and no exemption certificate is required. Qualifying items include: (1) for a purchase price of less than $3,000, portable generators; (2) for a purchase price of less than $300, hurricane shutters and emergency ladders; (3) for a purchase price of less than $75, batteries, single or multipack (AAA cell, AA cell, C cell, D cell, 6 volt, or 9 volt), first aid kits, fuel containers, ground anchor systems and tie-down kits, hatchets, axes, mobile telephone batteries and mobile telephone chargers, non-electric coolers and ice chests for food storage, non-electric can openers, portable self-powered light sources (flashlights), portable self-powered radios (including two-way and weather band radios), reusable and artificial ice products, smoke detectors, fire extinguishers and carbon monoxide detectors, and tarps and other plastic sheeting. 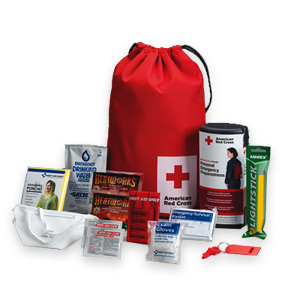 However, the following do not qualify: batteries for automobiles, boats, and other motorized vehicles; camping stoves; camping supplies; chainsaws; plywood; extension ladders; step ladders; tents; repair or replacement parts for emergency preparation supplies; and services performed on, or related to, emergency preparation supplies. Delivery, shipping, handling, and transportation charges are part of the sales price, and if the emergency preparation supply being purchased is taxable, the delivery charge is also taxable (e.g., if a rescue ladder is purchased for $299 with a $10 delivery charge, tax is due on $309 because the total sales price of the ladder is more than $300). (Tax Publication 98-1017, Emergency Preparation Supplies Sales Tax Holiday, Texas Comptroller of Public Accounts, 03/2016). 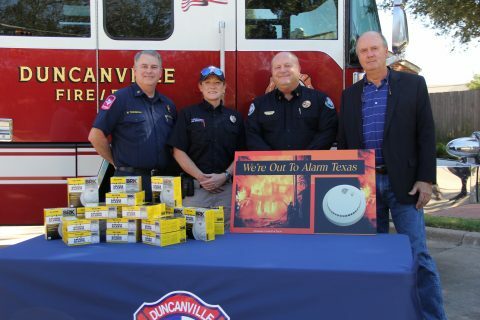 The City of Duncanville was selected to receive a 200 smoke alarm donation by the Insurance Council Of Texas (ICT) through its We’re Out to Alarm Texas program. 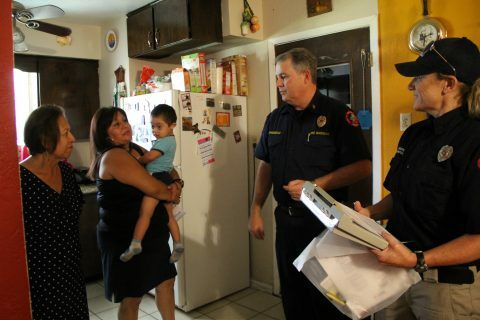 Duncanville Firefighters installed smoke alarms and conducted a home inspection for possible fire hazards in a Duncanville home today. The donated smoke alarms will be installed on a first-come, first-serve basis. Interested Duncanville residents should contact the Duncanville Fire Department at 972-780-4920. The Insurance Council of Texas (ICT), through its We’re Out to Alarm Texas program, recently distributed almost 2,000 smoke alarms to fire departments in 23 Texas cities in anticipation of Fire Prevention Week. 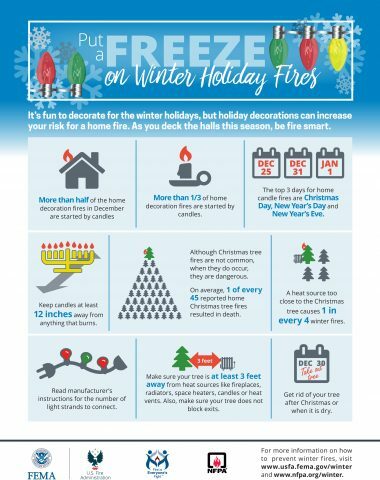 Working with Texas fire fighters, ICT has placed approximately 16,000 smoke alarms into the homes of seniors and other citizens throughout the state over the past 12 years. “ICT has been joined by other insurance organizations and First Alert to prevent needless tragedies from the lack of a smoke alarm,” said Mark Hanna, a spokesman for the Insurance Council of Texas. “Through the help of the State Fire Marshal’s Office, we have placed these smoke alarms in communities hardest hit by fire fatalities.” The Travelers Insurance Companies, State Farm, the Association of Fire and Casualty Companies of Texas (AFACT) and First Alert assisted ICT in making this effort possible. The Insurance Council of Texas is the largest state insurance trade association in the country consisting of approximately 500 property and casualty insurers writing business in Texas. For more information click on www.insurancecouncil.org or http://www.facebook.com/insurancecounciloftexas. Self-balancing scooters/hoverboards have been recalled by 10 firms due to fire hazard. Per the Consumer Product Safety Commission (CPSC), “The lithium-ion battery packs in the self-balancing scooters/hoverboards can overheat, posing a risk of the products smoking, catching fire and/or exploding”. For more information on the recalls, please visit the CPSC website. 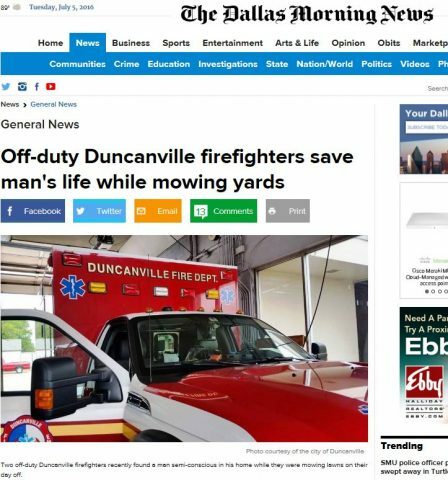 Dallas Morning News (7.5.16): Battalion Chief Robert Gideon called a client the day before he was scheduled to mow his lawn Wednesday for his part-time job. The 27-year Duncanville firefighter tried not to worry when the call went straight to voicemail, even though this particular client always answered his phone. His suspicions were correct. The elderly client was there, but in no position to come to the door. 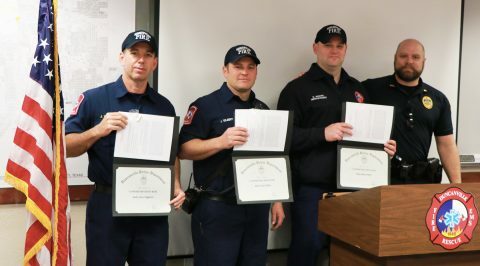 Gideon and his lawn-mowing partner, Duncanville firefighter Robert Shaw, entered the home and found the elderly man semi-conscious, lying on the floor. Paramedics later determined that he had probably been that way at least a couple of days. The two firefighters shouted his name and he eventually responded as Shaw called 911 and Gideon got on the phone with his own department. “If they hadn’t followed through with their instincts and concern, there is no doubt in my mind that the elderly male would have laid there and died,” Duncanville EMS Chief Mike Ryan said.